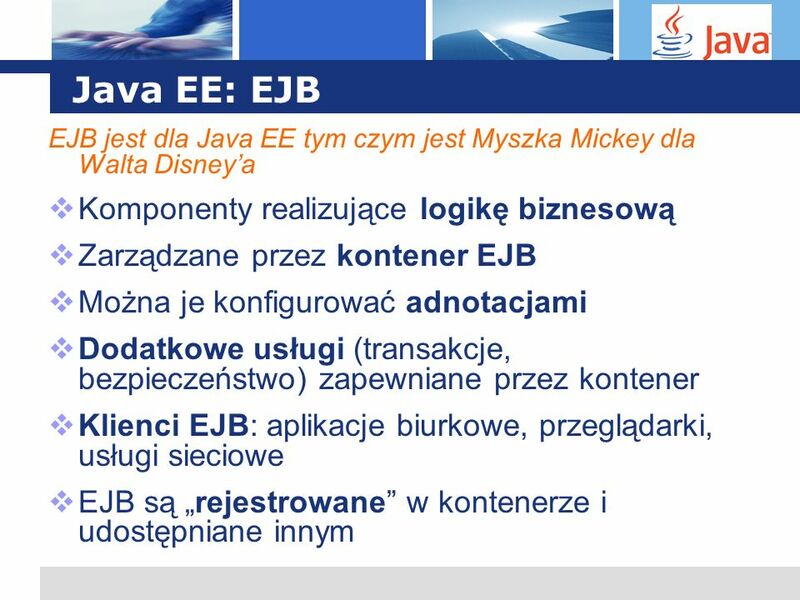 4 Java EE: FAQ Co to jest Java Enterprise Edition? Czym się różni Java EE od Java SE? Czy Java EE to to samo co J2EE? 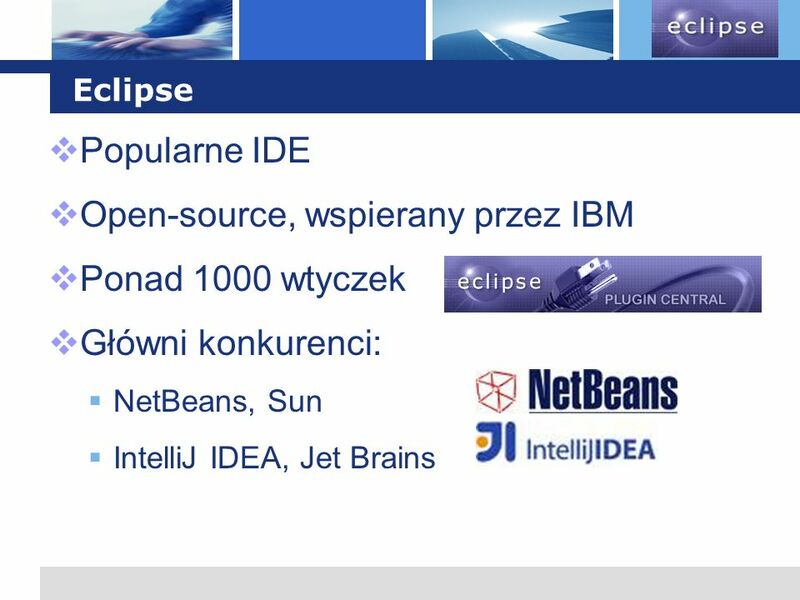 Czym się różni Enterprise Java Bean od Java Bean? Czy aplikacje Java EE muszą być uruchamiane na serwerach aplikacji? W jakim środowisku pisać aplikacje JEE? 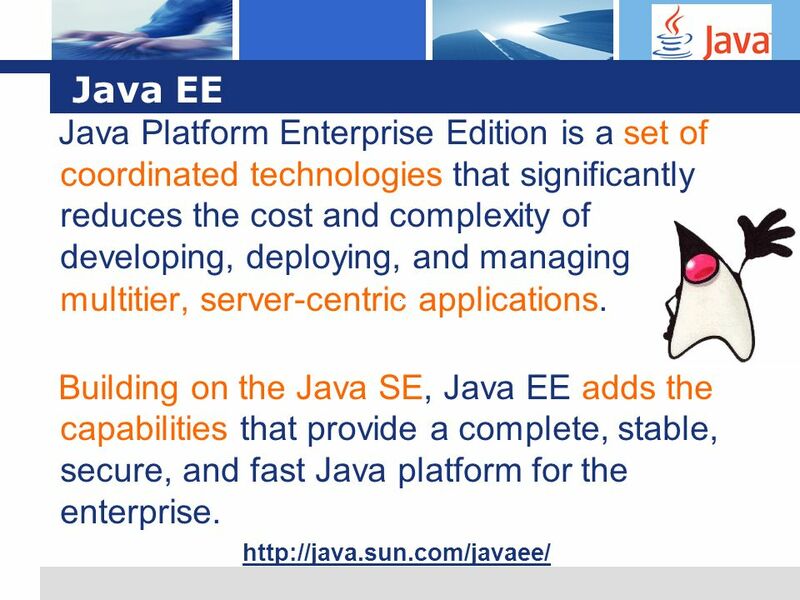 5 Java EE Java Platform Enterprise Edition is a set of coordinated technologies that significantly reduces the cost and complexity of developing, deploying, and managing multitier, server-centric applications. 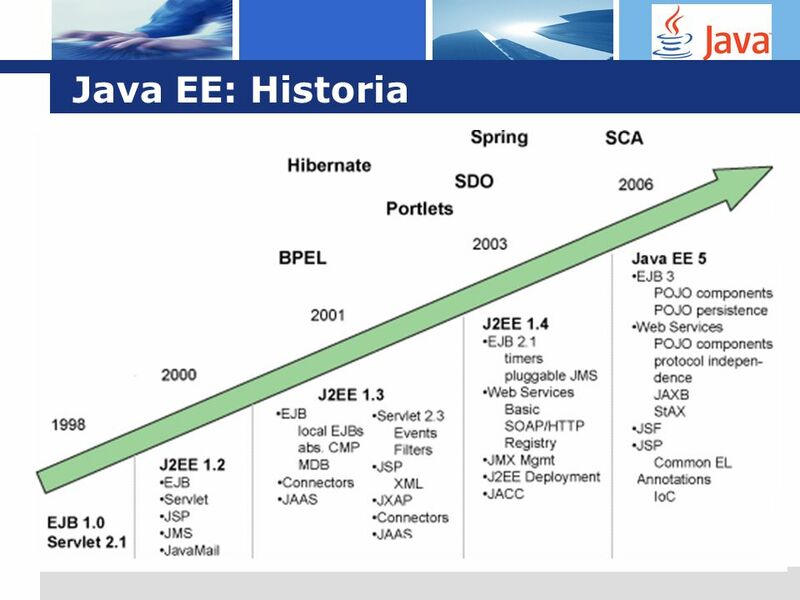 Building on the Java SE, Java EE adds the capabilities that provide a complete, stable, secure, and fast Java platform for the enterprise. JEE definiuje standard tworzenia wielowarstwowych aplikacji opartych na komponentach, oraz opisuje wymagania wobec ich środowiska wykonania. JEE wykorzystuje dorobek JSE oraz definiuje dodatkowe usługi. Powoduje to uproszczenie procesu tworzenia i wdrażania bezpiecznych i stabilnych rozwiązań biznesowych. 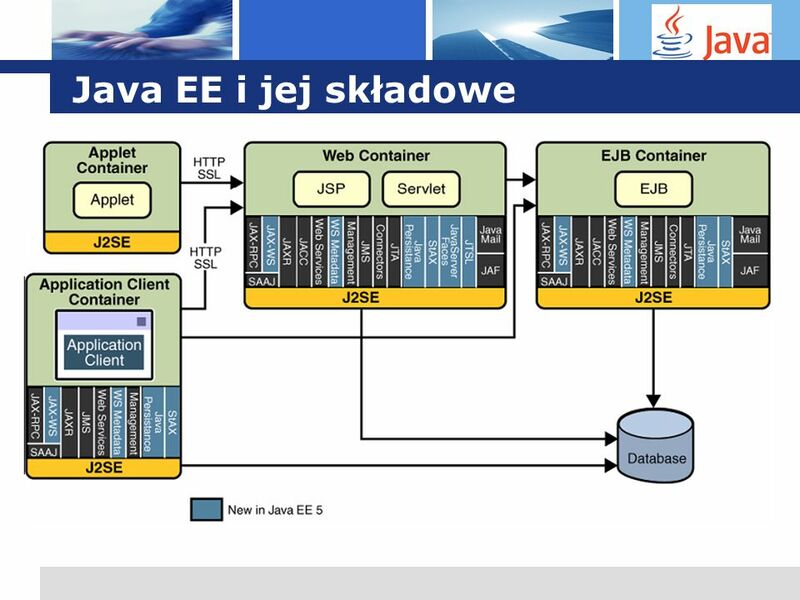 13 Java EE: Zmiany, zmiany... Gdzie Java EE zaspała? 17 Spring Framework : FAQ Co to jest Spring Framework? Czy w Springu pisze się programy w Javie? Czym Spring Framework różni się od Java EE? Czy to jeden z wielu webowych frameworków? Kto używa Spring Framework? 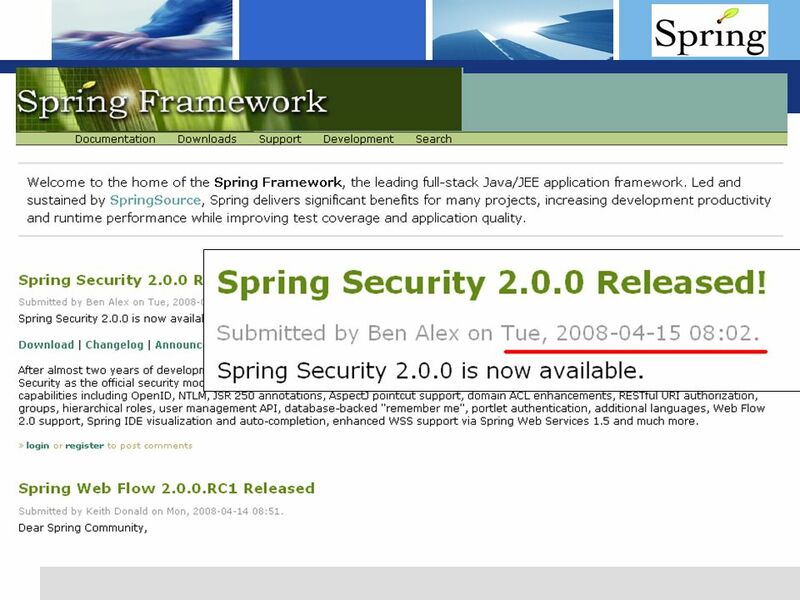 18 Spring Framework Spring is a lightweight inversion of control and aspect-oriented container framework. 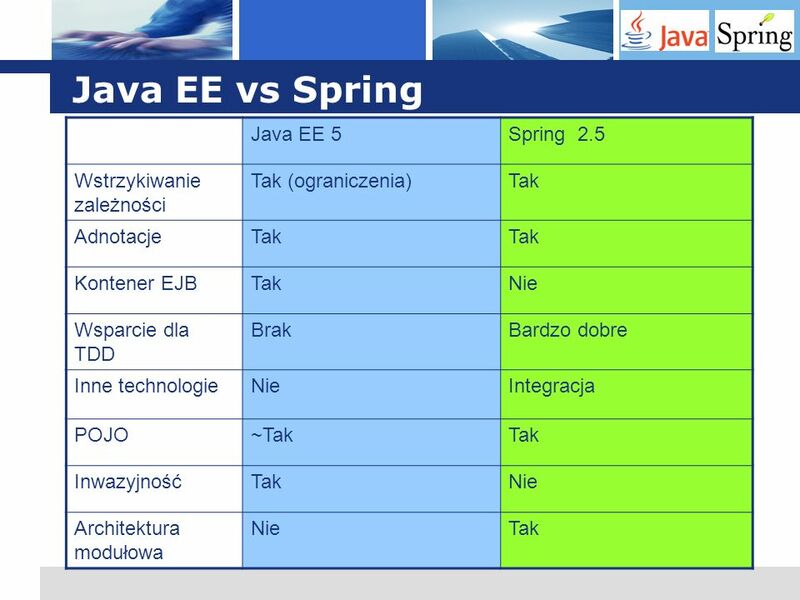 Spring nie jest implementacją JEE Spring nie jest serwerem aplikacyjnym Where Struts, WebWork and others can be considered Web frameworks, Spring addresses all tiers of an application Wyjasnienie: Lightweight—Spring is lightweight in terms of both size and overhead. The entire Spring framework can be distributed in a single JAR file that weighs in at just over 1 MB. And the processing overhead required by Spring is negligible. 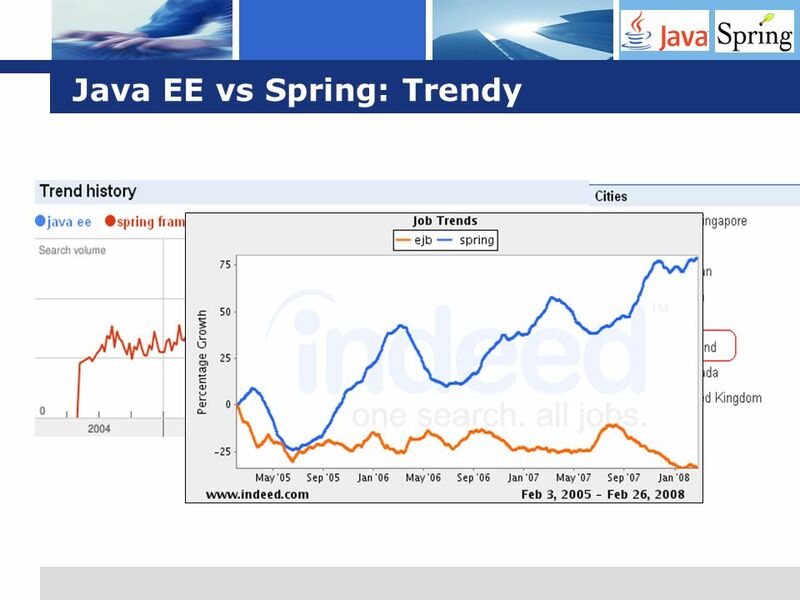 What's more, Spring is nonintrusive: objects in a Spring-enabled application typically have no dependencies on Spring-specific classes. Inversion of control—Spring promotes loose coupling through a technique known as inversion of control (IoC). When IoC is applied, objects are passively given their dependencies instead of creating or looking for dependent objects for themselves. You can think of IoC as JNDI in reverse—instead of an object looking up dependencies from a container, the container gives the dependencies to the object at instantiation without waiting to be asked. 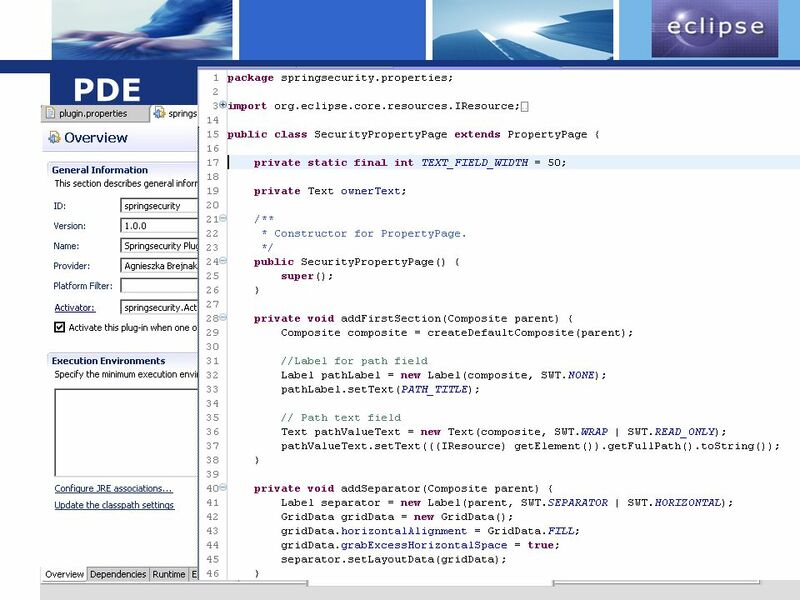 Aspect-oriented—Spring comes with rich support for aspect-oriented programming that enables cohesive development by separating application business logic from system services (such as auditing and transaction management). Application objects do what they're supposed to do—perform business logic—and nothing more. They are not responsible for (or even aware of) other system concerns, such as logging or transactional support. Container—Spring is a container in the sense that it contains and manages the life cycle and configuration of application objects. You can configure how your each of your beans should be created—either create one single instance of your bean or produce a new instance every time one is needed based on a configurable prototype—and how they should be associated with each other. Spring should not, however, be confused with traditionally heavyweight EJB containers, which are often large and cumbersome to work with. Framework—Spring makes it possible to configure and compose complex applications from simpler components. 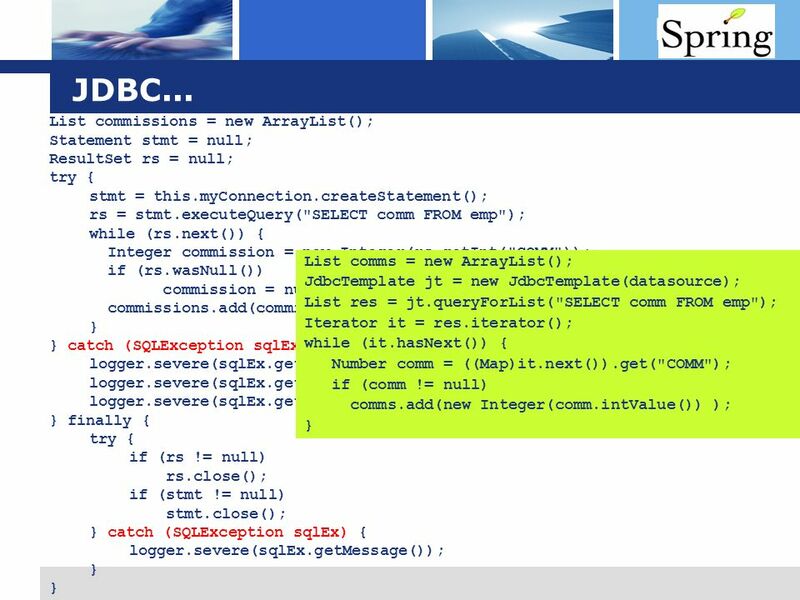 In Spring, application objects are composed declaratively, typically in an XML file. 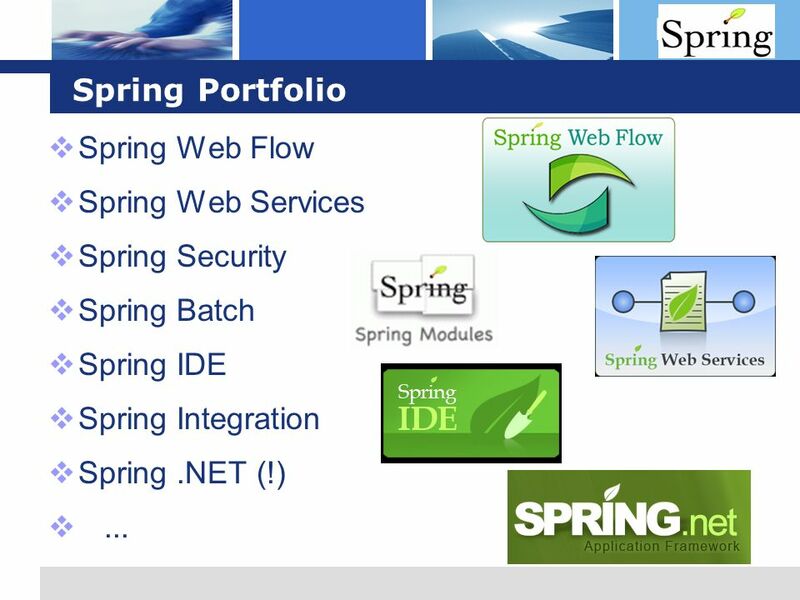 Spring also provides much infrastructure functionality (transaction management, persistence framework integration, etc. ), leaving the development of application logic to you. 39 Dziękuję za uwagę. Pytania? 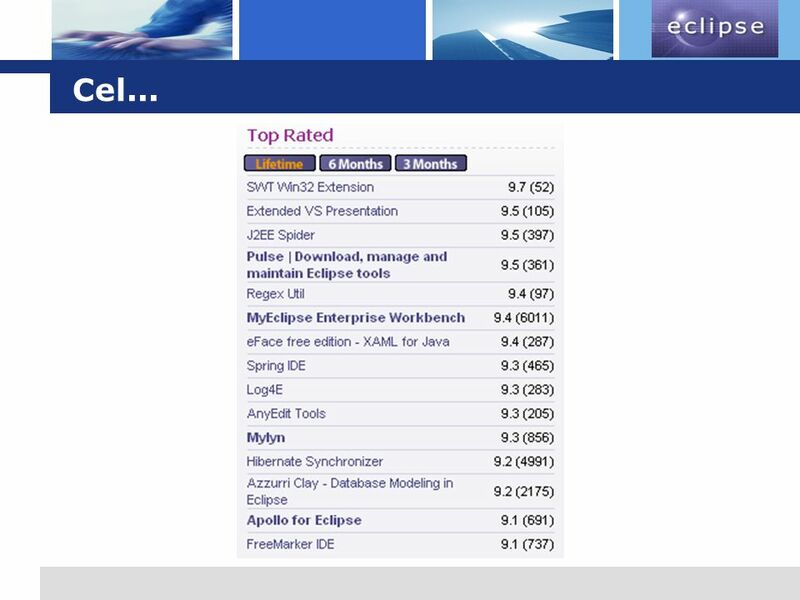 Pobierz ppt "Java Enterprise Ed. 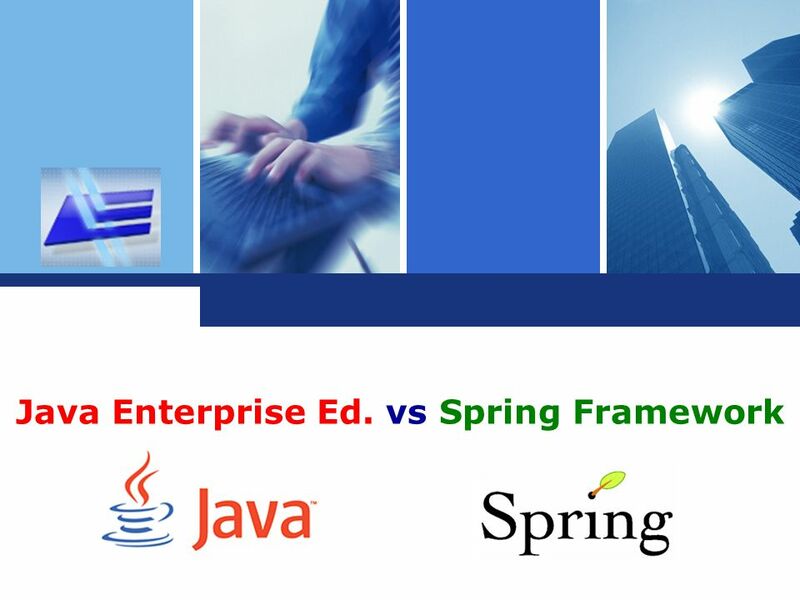 vs Spring Framework"
Architektura SAP R/3 Wybrane zagadnienia. 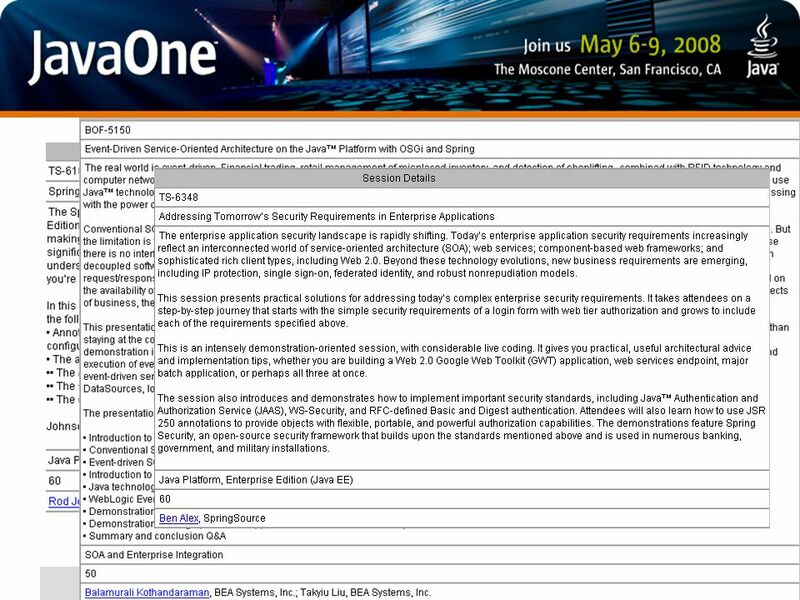 Platforma J2EE korporacyjny standard wytwarzania złożonych systemów informatycznych Autor: Jarosław Lis Warszawa, 2006r. Enteprise Java Beans Emil Wcisło.